Rotation. Motors rotate. Potentiometers and variable capacitors often rotate. It is a common task to have to rotate something remotely or measure the rotation of something. If I asked you today to rotate a volume control remotely, for example, you might offer up an open loop stepper motor or an RC-style servo. If you wanted to measure a rotation, you’d likely use some sort of optical or mechanical encoder. However, there’s a much older way to do those same tasks and one that still sees use in some equipment: a synchro. The synchro dates back to the early 1900s when the Panama Canal used them to read and control valves and gates. These devices were very common in World War II equipment, too. 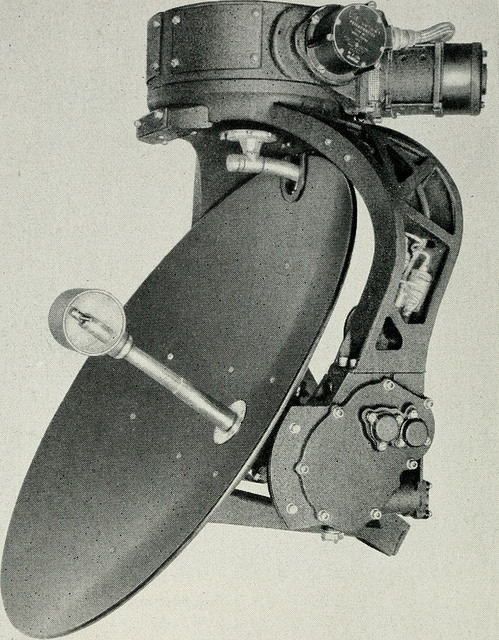 In particular, they were often part of the mechanisms that set and read gun azimuth and elevation or — like the picture to the left — a position indication of a radar antenna. Even movie cameras used these devices for many years. Today, with more options, you don’t see them as much except in applications where their simplicity and ruggedness is necessary. A synchro looks like a motor, but it is really a transformer optimized for specific applications. For example, it is common to see a synchro transmitter and a synchro receiver, although usually the devices can work as both. When wired together and excited with the proper AC voltage, turning one synchro shaft will turn the other the same amount. And one transmitter can drive multiple receivers. For example, an airplane cockpit may have an instrument that uses one transmitter and has two receivers, one for the pilot and another for the copilot. A basic synchro is similar to a motor in that it has a rotor and a stator. However, each of these has a transformer winding. Some devices use single phase and others use three-phase. In addition, devices made for vehicles probably use 400 Hz AC instead of the 50 or 60 Hz common for stationary units. Usually, light-duty units made to drive indicators use single phase but synchros that transmit torque will use three-phase connections. You can consider a synchro as a variable-coupling transformer. Rotating the shaft varies the magnitude of the magnetic coupling between the primary and secondary. That means the output voltage varies based on the shaft position. If you wire two synchros together, the circuit acts like a bridge. When the two devices are in the same position, the system is in balance — that is, putting out equal and opposing voltages. 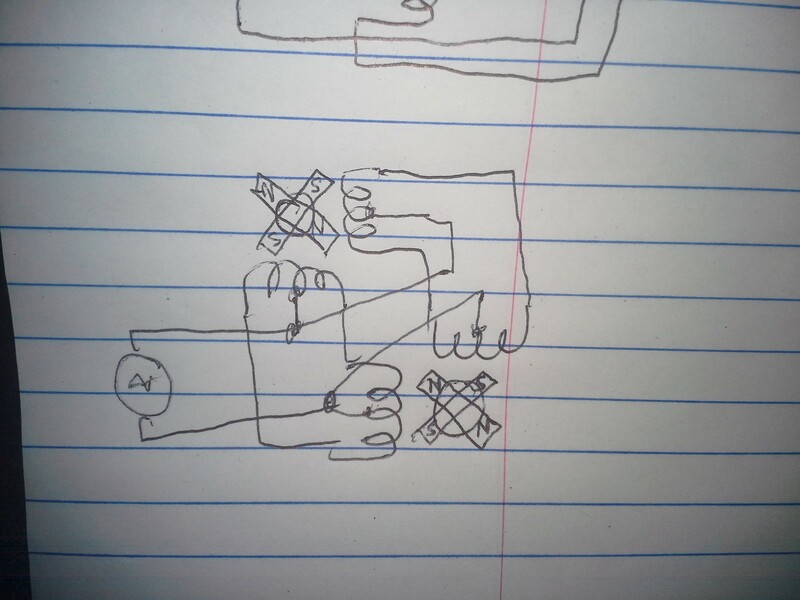 But if one shaft moves, the imbalance causes current to flow through the windings moving the other shaft to equilibrium. This configuration is sometimes known by the old General Electric name Selsyn. Other trade names included Teletorque and Autosyn, but you don’t hear those as often. There are many variations. Some synchros have brushes and others are brushless. Some are made for precision. In high precision applications, you may have a coarse transmitter slaved to a fine transmitter that rotates multiple times for each full rotation of the coarse shaft for reading a more precise value. You can think of this like a clock, where the big hand goes around twelve times for each rotation of the little hand. Usually, the gearing ratio is 36:1 or 72:1 so that each rotation of the fine shaft corresponds to five or ten degrees of the coarse transmitter. Making a little handle turn a giant gun mount was problematic. At first, the receiver motor just told a human what to do using an indicator and then the human operated the gun. However, the development of the amplidyne made it possible to amplify the synchro outputs to directly drive larger loads. The amplidyne has a superficial resemblance to a dynamotor — that is, a generator turned by a motor. However, in a dynamotor, you turn the generator to make a high voltage. In an amplidyne, the motor still turns the generator, but an input voltage is put on the generator’s field winding. The more current you apply, the higher the output voltage. This creates a very low-frequency amplifier that takes a current input and produces a voltage output. Amplidynes found use in other applications, too. Elevators, locomotives, and even nuclear submarines. Of course, today, we have much better options for doing high power amplification, but there could be a few still hiding in some old building’s elevator, somewhere. Because these were used extensively in the Navy, one of the best sources of information is an old Navy pamphlet (if you consider 166 pages a pamphlet; if it disappears, search for OP 1303). If you want something more modern, Moog (the aerospace company, not the synthesizer company, although the companies were founded by cousins) has an application guide and a handbook you might find interesting. You won’t find too many of these interesting devices in use today, although there are companies that make modern encoders that specifically target traditional synchro applications. Of course, tubes made a comeback. Maybe that pile of World War II surplus synchros in the secret Hackaday bunker will be worth something one day. Speaking of World War II, check out the 1944 instructional video below about airplanes that could move guns electrically using all these components. Similar to synchros, there were also resolvers, which had 4 fixed windings instead of 3. Great story. Back in the day I worked at GD on the F16. You might be surprised to learn that a 4th generation fighter is loaded with syncro modules. Most are tied to radar scanning. The modules act a D/A converters for the digital flight control systems that actually do the controlling. Today Lockheed Martin is making the Block-70 version of the F16, I have no doubt someone in that airframe that syncros are still being used. Could this be done other ways-yes. But are those other methods robust and proven enough for battle systems and perhaps more importantly are they backward compatible with prior systems to ease the issues in managing the replacement of any LRUs? 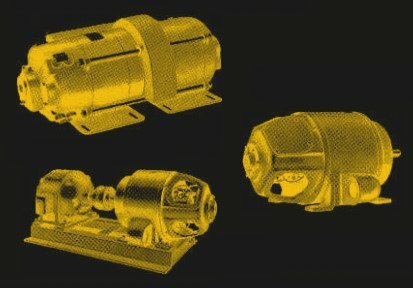 The Inertial navigation systems I worked on in the ’80s used resolvers, connected to A/D converters, to read the position of anything that moved. They were considered more reliable than anything else available. I went through USAF Avionics school in the early 2000’s, and they were still teaching synchros. I did question the heavy C-141 emphasis in the training modules, since that airframe had already been retired, even from the Guard units that got them handed down from active duty. That said, some of the backup instrumentation on the C-17 is still based on them, as well as the primary instrumentation on a few of the older airframes. Synchros, resolvers, LVDT and RVDT (linear and rotary variable differential transformers) are still used a lot in aircrafts. It is very sturdy, passive, temperature and dirt proof (compared to optical encoders), galvanically isolated (great for lighting protection) and the wires can be tens of meter long and still provide precise measures. Intelligent sensors can use local ADC and digital busses, needing less wires and power, but the reliability cannot reach plain old resolvers, particularly when exposed to wide temperature ranges. Could one use a synchrono connected to a DC motor via a rotating shaft as an AC to DC converter? Oops! Should have read the article! Thanks, I had no idea how a Selsyn or a syncro worked! Aside from avionics applications, the last usage I witnessed of syncros was on the 36 inch refractor telescope at Lick observatory. That was back in the early 80s, but I wouldn’t be suprised if system was still in use today. You can also take two stepper motors and wire them to each other. Then when you turn one the other will follow. That only works at ‘high’ rotational speeds (if you spin the motor shafts too slowly the friction from the motors overcomes the generated torque). The magic of a syncro is the additional winding driven by an external AC source which allows them to operate at arbitrarily slow speeds without loss of torque. Tried that a few (8?) years back with two BLDC motors. I got movement, sort-of. when I started working at a facility that had high precision continuous process equipment, it was driven by motor generator sets and amplidynes controlled by tube amplifiers running DC motors. We converted to solid state AC drives to reduce maintenance. But there was an unexpected downside. With the old system, there was enough rotating mass and heat in the tubes that we could ride through a 1 second power failure. The solid state system had no such reserve, and if we lost just a few cycles, the machines would all shut down, at a cost of hundreds of thousands of dollars. Can I do this with two alternators? Remove the rectifiers and wire the coils together. Would exciting the rotors and rotating one make the other move? I would think so. You could start with driving the rotors with 60Hz from a 12-24 volt transformer. One neat thing about this system is that the receiver will “lock” into position at powerup unlike a typical quadrature encoder that has to be homed and counted to get into a known position. Cool, I always wanted to know how the turrets on the Millennium Falcon worked! They worked by mass x acceleration. We used Selsyn’s with a lead screw device to move samples into and out of powerful xray beams. The force feedback was neat as you could feel the lead screw topping or bottoming out. PS: great article, love reading about this old stuff. Learning and understanding how they used to do things (completely different then today but with the same goal) is an eye openener every time. I love those old training films. Also “-dyne” isn’t used enough these days. Ah. So now I know why aircraft have 400Hz labels on them. But why 400hz and not 50/60 or even 100/500 ? 400 Hz motors are far more efficient in power to weight ratio. I thought of saying something similar (400 Hz also leads to smaller transformers and other components as well), but I realized that the question could also be interpreted as “why 400 Hz, and not some other high frequency?”. I didn’t have an answer to that. Maybe going past 400Hz would be getting close to the useful part of the audio range? Just as GreenBit already said, it’s a matter of losses. At 400 Hz you can get away with good quality, but common and cheap transformer steel. Higher than that, and you start to need different magnetic materials. There were systems with higher frequencies. At least some soviet space stuff was running at 1000 Hz. There you need even more weight saving than in aircraft, and don’t really care, if core materials become more expensive. Is it weird that every time I read one of your historical technology articles I imagine needing this information in case I accidentally travel back in time? But not too far back. You’d have to create the right copper alloy, and demonstrate wire-pulling. 400 Hz is always related to aircraft which means this module was probably designed for aircraft. I’ve got a North Atlantic 8300 synchro resolver/meter still in factory wrap sitting on my shelf, supposedly worth well over a thousand dollars, but who exactly needs a Synchro Resolver/ Meter these days?